Well I’m back from Florida and I am happy to say I missed a major snowstorm! 6 days of 80 degree weather and hanging out on the beach was tough to take, especially knowing I was missing out on all that shoveling! 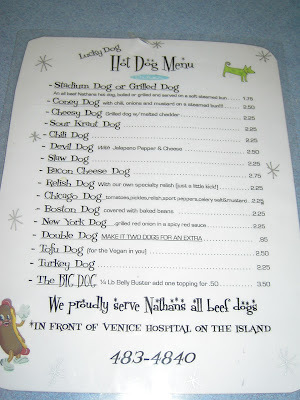 One thing I like to do when on vacation is partake in local hot dog joints. 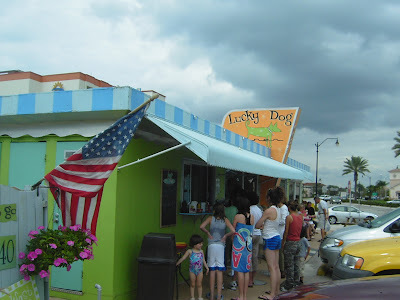 This trip featured the discovery of Lucky Dog, a small, lime green diner en route to our favorite beach spot in Venice, FLA. We went at about 1:30 PM and there was good foot traffic outside. and her brother Alan Laskowski (below). This is them when they were kids. 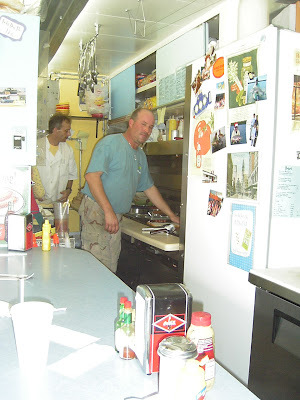 The Lucky Dog Diner has been around since 1952 and the brother and sister team bought it last year. They spent 4-5 months fixing the place up and painting it the signature lime green. Brother Alan did most of the work under the supervision of Dawn, who, by mutual admission, is the “real boss” of the Lucky Dog. 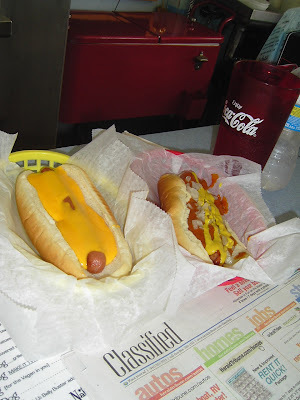 The place is a real, honest to God, Hot Dog Joint with a sense of Americana you just don’t get in the modern fast food establishments that litter the landscape of Florida (and everywhere else for that matter). 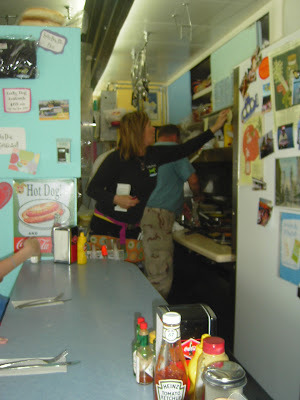 I told them about the Hot Dog Truck and asked if I could snap some photos and put them up here on theHotDogTruck.com. They were delighted and happy to share their story. 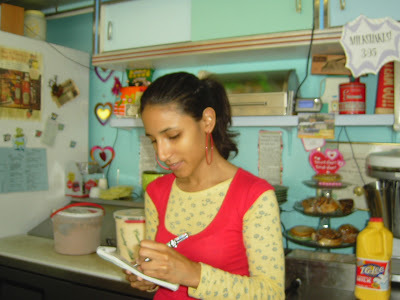 Our server, Heish (sorry if I misspelled it) was not too keen on having her photo taken, but she took care of my gang so well, I can’t help but embarrassing her! 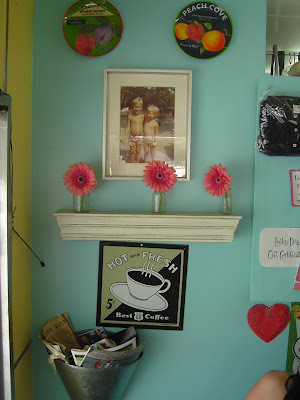 the kids ordered up milk shakes, cheeseburgers, grilled cheese and hot dogs. I got to chatting with the guy next to me and he let me take a picture of HIS lunch, a Coney Dog and a Cheese Dog. YUMMY LOOKING STUFF, eh? 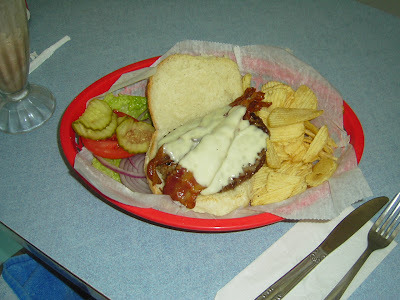 My 11 year old daughter, who would rather eat a cheeseburger than just about anything else (she had at least one per day on our trip), said her Lucky Dog Bacon Cheeseburger was the best one of the trip! 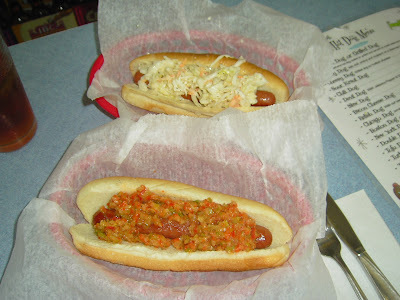 The three year old got a plain dog while I opted for the Relish Dog which was topped with a “secret recipe” house relish that had a bit of a bite to it (it was very good) and a good old Slaw Dog. Both were excellent! 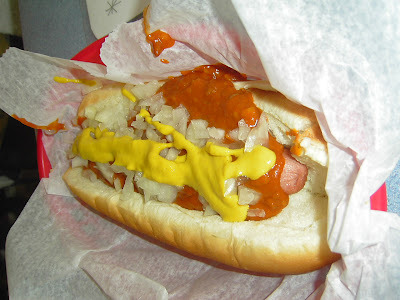 I was pretty hungry so I got my own Coney Dog for dessert!